John before he left town, working on one of his amazing masterpieces. Do notice the tiny statuette in the back. 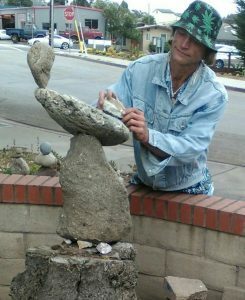 Morro Bay, CA — I’m wondering because some artist is creating fabulous stone-on-stone “statuettes” again, and on the same street corner. Statuette is not the perfect word. But it’s the best I can think of. Well, you may remember John Petitt and his incredible work. I wrote him up here 18 months ago. Sad to say, John was a broke and homeless recovered drug addict, 40 or so. He came into town from down south somewhere and stayed a while. He had an amazing talent. One I had never seen in anyone before. The sole tree on that corner with the raw “art materials” neatly clustered under it. Who went to the trouble of doing that? beautiful statuette. No cement. No sticky tape. Just a sharp eye. Gravity is what did the trick. I saw he had a unique talent. I call it unique because I had never anyone with that talent. He could pick up a stone and position it just right on the ground. 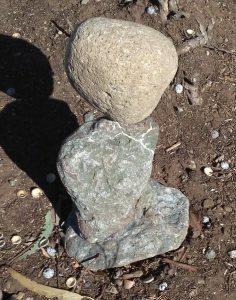 Then add another stone, and another, or maybe a chunk of rock, and leave behind a thing of startling beauty for all to behold. He worked anonymously. Never for hours. Just half an hour, or an hour, or if excited by his work, a bit more. Would leave without ever identifying what he had just created with a little sign or something. I marveled at his work. Finally I tracked him down. The statuettes he created required enormous imagination and a super-delicate feel for perfect balance. He put one together quickly. Did so and time and again. He might have a dozen on display on that tiny corner of land. As I said, no tool of any kind. Just his eyes and his fingers. And patience. What patience! I know because one day he let me watch. 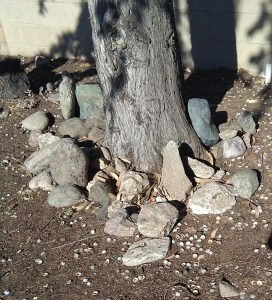 Look carefully and you’ll notice it has not 2, but 3 stones! Also notice the delicate balance points I’ve mentioned. Hope it stays up a while. stayed put. More than once he created a triple. One stone atop another atop another. Wow! The trick was what two or three stones he should choose. Then how to place them, which at the bottom and which atop it, and which above that. And at what point for each. The point was critical. A mere quarter of an inch to the left of that point, or to the right of it, or in front, or in back, and it wouldn’t work. It would fall off. That didn’t faze him. He’d give it another try. And another. Finally success. But two or three days later he’d return and find the stones all down on the ground. Me, too. Maybe a stupid vandal knocked the statuettes over. Maybe it was a strong wind blowing up from the ocean. Anyway, John would pick up the stones, maybe use new ones, and begin again. To my knowledge he never had an audience. And never made a dime at it. His only reward was self-satisfaction. But I believe that’s what motivates most artists, whatever their art. Feeling good about what they’re creating is their pay-back. 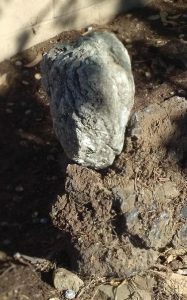 Rock neatly, precisely placed in ancient tree stunk. Who would think of doing that? artist. Who would doubt that?! Then John took off. No idea where he went. I hoped it wasn’t because of drugs again. That little triangle of land which became his studio is at the corner of St. Timothy’s Catholic Church. I pedal by it on my trike every time I go to the Library. No statuettes left. The stones and broken rocks litterd the ground. But of late I’ve seen new statuettes. I’ve paused and studied them and marveled again. One day I saw six! Beautiful. But a bad day for pictures. When I went back the next day, only three still stood. I snapped them with my cell phone and I’m including them today. So I’m wondering: is John back? I don’t know. We were friends. I think he’d look me up. Or is this a newcomer who had noticed John’s work, been inspired by it, and is now trying his hand? Either way, I’m delighted. I’d be pleased to hear John is all right and again doing what he loved and in his favorite studio. I’d love to have a coffee with him. But if If it’s a new artist, that would also make me happy. For sure he would have learned how to do this from John. Hey, he might be a she. Why not? Women are really coming into their own. Wouldn’t that be something? !